Many of our largest Druid orders originated from 3 main traditions. 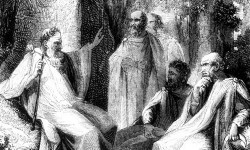 It can be useful to know about these perspectives when exploring groups, so here is general information on Revival, Reformed, and Neopagan orders in North America. 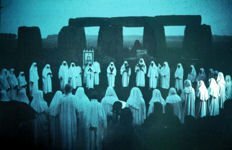 Starting in the mid 1600’s people in Britain – and a little later on, in several other countries – turned to what little was known about the ancient Druids as a source of inspiration and a basis for a new spirituality founded on nature and personal experience. This was the start of the ‘Druid Revival’. It is inspired by the accounts of ancient Druids, and draws on the work of historical researchers, folklorists, and early literature. Essays on the start of the Revival can be found at OBOD and at AODA. Training: For 20 years OBOD has offered an excellent three part training course, and a mentor will be assigned if desired. The fee for the course can be shared, and an introductory package is available. Training: three degree training program. The First Degree training program has been compiled into a book titled The Druidry Handbook, by John Michael Greer. Reformed Druidism: starting in 1963 as a protest against coerced religious attendance at Carelton College in Minnesota, students explored world faiths and personal paths. Reformed Druidry emerged, and is known for a lack of dogma, loose hierarchy, eclectic traditions, a wry sense of humor, and spawning many other groups. The term ‘reformed’ is used to recognize that members no longer take part in the alleged abuses of the ancient Druids. (Recognizing that everyone in antiquity participated in practices that are not accepted today.) Go to the RDNA archive site for their FAQs on the Reform. Neopagan: a term that distinguishes the historical Pagans of ancient cultures and the adherents of modern (c1960’s on) pagan movements. Neopagans tend to emphasize pantheism or nature-worship, or have revived or reconstructed aspects of historical polytheism. For more interpretations or definitions of this term go to Wikipedia, and ADF. 1. The object of the search for religious truth, which is a universal and a never ending search, may be found through the Earth Mother, which is Nature; but this is one way, yea, one way among many. 2. And great is the importance, which is of a spiritual importance, of Nature, which is the Earth Mother; for it is one of the objects of Creation, and with it we do live, yea, even as we do struggle through life are we come face to face with it. 2. Likewise, Nature is good. Formed in 2006, RDG follows the basic 2 tenets of RDNA (‘Nature is good’ and ‘Nature is very good’). The Reformed Druids of Gaia is intended to be an international expression of the RDNA. Note: This order’s websites have been down from about May 2017, queries have been unanswered, and it may be defunct. This Druid Groups page was originally published on 8-6-2009.